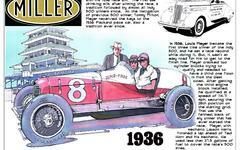 It's true, Carl Fisher got all the attention when it came to the four founders of the Indianapolis Motor Speedway. But there's a good chance he couldn't have pulled it off without a great supporting cast. That's where James Allison, Arthur C. Newby and Frank Wheeler come in. Each made significant contributions to launching the great Speedway. I have obituaries for each of these men and plan to add more articles focusing on them over time. Indianapolis Motor Speedway founder Jim Allison's death was front page news in the August 4, 1928 edition of the Indianapolis News. It was also somewhat controversial. Allison had recently divorced his wife of over 20 years to marry his secretary. Frank Wheeler was the first of the four founders to leave the Indianapolis Motor Speedway, and, four years later, was the first to pass away. Suffering from diabetes for years, his health deterriorated rapidly in the last few months of his life. A wound to his foot stubbornly refused to heal, and he increasingly became despondent over his perdicament. A proud man, he elected to take his life using his favorite shotgun. This is a second obituary for James Allison, which appeared in the Indianapolis Times. Another nice summary of not just the circumstances of his death, but his biography as well. A sidebar focuses on reactions from Miami, where Allison, teaming with his old friend Fisher, had numerous business investments. He also lived in Miami much of the year in the 1920's. You can read the other obit elsewhere on First Super Speedway. Arthur C. Newby's obituary in the Indianapolis News is chock-full of information about the man. His nickname, "the quiet philanthropist" was well earned. Note his $100,000 gift to Riley Children's Hospital and how he stepped in to save Turkey Run State Park from encroaching development. J. W. Atherton, secretary of finance at Butler University said this of Arthur C. "Art" Newby at the time of his passing, "Modesty and sincerety were among his chief charms. Indianapolis and community and many friends have sustained a severe loss in his passing." Printed September 12, 1933 in the Indianapolis Times, this was the briefest obituary for Arthur C. "Art" Newby of the three major dailies serving the city. This is a curious piece I stumbled across from the August 5, 1909, Indianapolis News. It is a report that black sheep founder of the Indianapolis Motor Speedway, Frank Wheeler, was cited for assault when he struck a man - George Powell - on a bicycle while driving his passenger car.